You know those times when you want to upload a new photo to, say, Facebook or Pinterest? The typical browser-based upload tool forces you to click through countless folders until you find the one you want. It's a slow and often maddening dance. Fortunately, there's an easier way. 1. Open Windows Explorer and find the photo (or document) in question. 2. Hold down the Shift key, then right-click the photo. 4. Now, in your browser, head to Facebook or wherever, access the upload tool, and click Browse. 5. Press Ctrl-V to paste in the file location, then click OK.
That's all there is to it! No hunting through a bunch of folders to find the file you want--just paste the path and you're done. 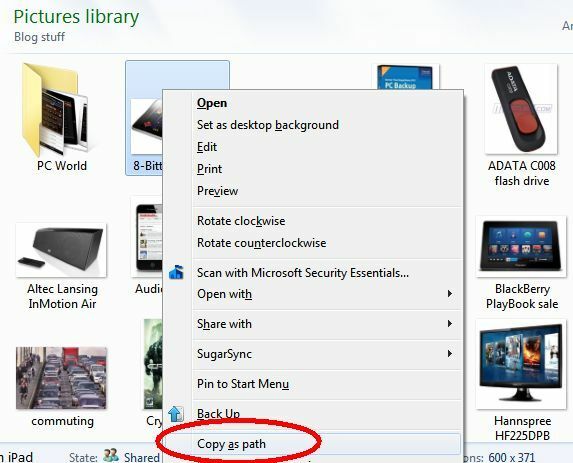 I must give credit where credit is due; I first heard about this clever tip from Windows guru Ed Bott. But it's too great not to share; once you start using it, you'll wonder how you got along without it.